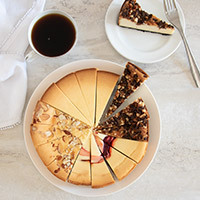 Cheesecake is easily a favorite treat for people around the world, but sometimes finding a place to get quality desserts sent nationwide can be difficult. Buying a cheesecake online may seem like an unusual idea but ordering one online may just be the answer to your gift giving needs. When you purchase cheesecake online, you can find the perfect gift for anyone on your shopping list. Take the worry and window-shopping out of gift giving this year and send a cheesecake to your loved ones. Buying a cheesecake online means you can skip the crush of shoppers at the mall, the trek through the parking lot to find your car, the long waits in line, and the anxiety of looking for the perfect gift. We deliver to your loved one’s front door. It will only take a few minutes and as soon as you click your mouse you are done. We will take care of the rest. Cheesecakes are very popular desserts, and they make great gifts for your family and friends. So often, we spend time running from store to store agonizing about how to shop for picky family members or for large families. Instead of guessing what each person would like, send the entire family a sampler with four different flavors! They will all enjoy the dessert and will be able to spend quality time together while eating it. Sounds like the perfect present! Right?!? Buying cheesecake online also allows you to shop any time of day. The holidays are almost here, and we all know just how stressful this time can be. From searching for the perfect present to cleaning the house and planning a fabulous holiday meal, you could use a little convenience. Neighborhood bakeries have specific hours and if you cannot visit the shop during that time, you are out of luck! We take orders 24 hours a day, seven days a week – no matter the time zone. This provides a relaxing environment for shopping and will get you the cheesecake you want without any hassle. Purchasing a cheesecake online lets you shop for the right cheesecake for the occasion. With our large variety of cheesecakes available online, you are sure to find the size and flavor you want. 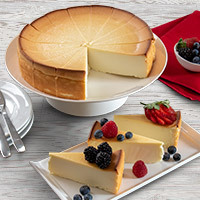 Whether you are looking for small snack-size cheesecakes or want larger cakes, you will find exactly what you need at a price you can afford. The real beauty to shopping online lies in the fact that you can have your gift delivered nearly anywhere in the United States. Your friends and family may be all over the map, but one stop here and we will take care of the rest. 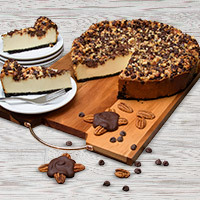 If you decide to order online, be sure to order from a company like Cheesecake.com that specializes in cheesecake and dessert gift giving. Just like anything else, look at the fine print. You not only want to select a company that has excellent customer service policies – you also want to purchase your gift from someone who is known for making a quality product and one that backs it with a simple, honest guarantee like ours. If someone you sent a cheesecake to isn't happy, just let us know and we'll cheerfully refund your money or send them something else out immediately. Ordering cheesecake online may seem like an odd idea at first, but there are a number of ways you can benefit from shopping this way. 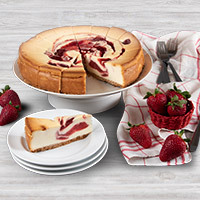 Whether you are looking for a cheesecake to serve your dinner guests or the perfect gift for your loved ones, an online cheesecake order is the answer!